Thunderous performance from lovely V8 engine. Understated styling. Great handling and traction. The usual high quality you'd expect from Audi throughout. Not available as a manual which may put off some enthusiasts. Seven-speed transmission 'protects itself' so the car can be frustratingly slow off the line. 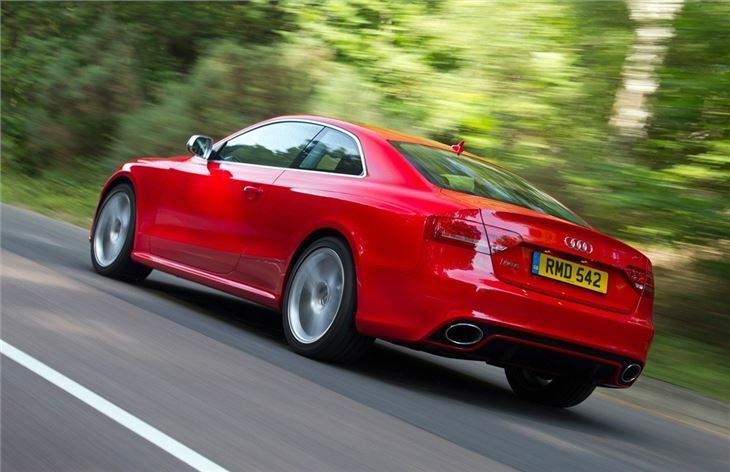 Sitting at the pinnacle of the Audi A5 range is the high performance RS5 - what many people see as the natural successor to the legendary Audi RS4. It's powered by an uprated version of the 4.2-litre V8 used in the S5 Coupe which delivers a mammoth 450bhp and a resulting 0-62mph time of 4.6 seconds - a match for even the mighty BMW M3. 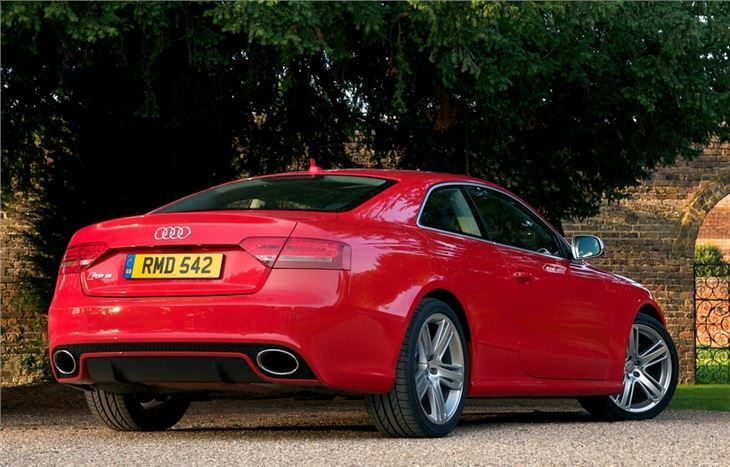 And not only does it sound great as you'd expect, with a deep rumble from those big oval exhausts, but the V8 is also the highest revving engine in the class, spinning up to 8,250rpm. However, what makes the RS5 really stand out from the likes of the BMW M3 is the fact it comes with quattro all-wheel drive. The result is one of the finest handling coupes around with immense grip and incredible traction, even on slippery roads or when exiting a slow, tight corner. It flatters even the novice driver, although you're always aware that you've got a huge amount of power under your right foot. It really does go like a rocket from standstill, but it doesn't have the unruly element of the M3. 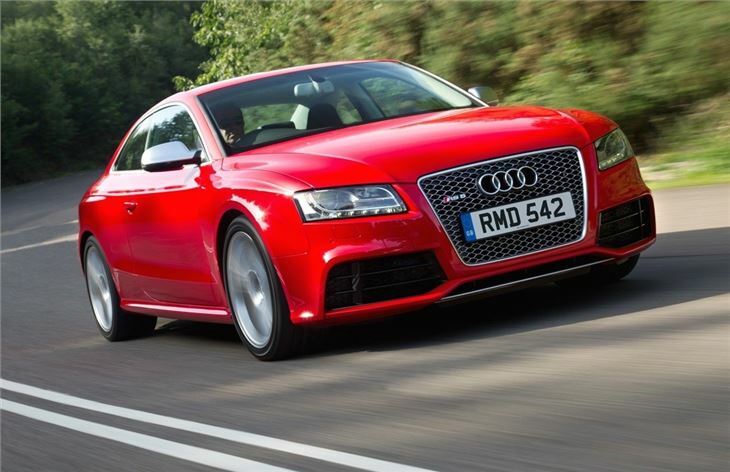 Instead the RS5 is a little more forgiving, allowing you to enjoy it in a relatively relaxed manner, rather than the often frantic feel you get behind the wheel of the BMW when you're driving quickly. It also rides incredibly well for a sports coupe that's so flat in corners, with firm but forgiving damping. One downside for some may be the fact it doesn't have a manual gearbox. Instead, like many modern performance cars, it has an advanced automatic transmission as standard. In this case it's Audi's double-clutch S tronic system with seven speeds which offers super-fast shifts with steering-wheel mounted paddles as standard, so you can change gear yourself. It's not a cheap car to buy new, but it does come highly equipped and is also one of the more efficient performance cars of this ilk, averaging a claimed 26.2mpg.